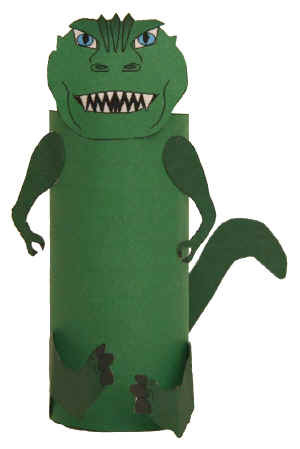 This is a simple cut and paste paper craft that's pretty much just your basic t-rex type dinosaur... But with a little imagination it works as Godzilla too! It uses a toilet paper roll as a base to make it three dimensional. Glue the legs and arms onto the side of the toilet paper roll. Fold the tail in half so it is coloured on both sides and use the tab to attach it to the back of the toilet paper roll (give it a 3D effect with the tabs). Fold the scales in half so they are colored on both sides. Attach them to the back using the tabs to give them a 3D effect.